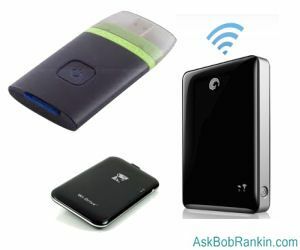 The portable wireless storage device, sometimes called a wifi hard drive, is a wonderful gadget. It can function as a backup drive, or as an external hard drive to add extra storage capacity to any wifi-enabled device. Many first-time buyers of the iPhone and iPad opt for the smaller 16GB storage to save money, but regret their choice later. The wireless storage device solves this problem and makes it easy to do backups over a wireless network. Here are some examples of how the concept is implemented. The $100 AirStash is a portable wireless storage drive. It consists of an SDcard reader with a built-in WiFi access point. Any WiFi-enabled device can connect to the Airstash as it would to a WiFi network, and access any files on the swappable SDcard. Up to eight devices can connect to the AirStash simultaneously through a Web browser interface. This design effectively provides unlimited portable storage, although the amount of storage available at one time is limited to the capacity of the SDcard currently inserted in the AirStash, which supports cards up to 32 GB. A USB connector lets you plug the AirStash into a compatible device to load it up with files and charge the lithium ion battery. Battery life is about five hours. The AirStash works with iPods, iPhones and iPads, but is not limited to Apple products. You can connect it to a laptop, PC desktop, Android smartphone or tablet, and enjoy the benefit of being able to access a larger amount of storage over a wifi connection. An added benefit is the ability to access your "stashed" files on ALL of your wifi-enabled devices. It's a bit like cloud storage, without the need for an Internet connection. Seagate's $200 GoFlex Satellite is a 500 GB portable wireless hard drive with built-in 802.11 b/g/n WiFi connectivity. The compact device is a streaming media server that supports up to three simultaneous connections. The range of the WiFi connection is up to 30 feet from the GoFlex Satellite. Its software can automatically sync media and document files from a PC or Mac via the hardwired USB 3.0 port. It comes with a car charger, and the battery life is up to five hours. Kingston Technologies recently introduced its Apple-only Wi-Drive in two capacities: 16 GB of flash memory for about $100 or 32 GB for $130. The high prices and limited capacities make the Wi-Drive a tough sell. Lack of support for non-Apple devices only limits this device's appeal further. Hitachi's $200 G-Connect system is a portable 500 GB hard drive, a WiFi access point, and a router all rolled into one device. Unlike other WiFi hard drive products, this one can be plugged into a wired network via an Ethernet cable. It then acts as a bridge between the wired network and multiple WiFi devices. Hitachi says up to five devices can simultaneously view standard-definition movies. The G-Connect also acts as a portable USB hard drive when plugged into a PC or Mac. Finally, there is an app that turns an iPhone or iPod into a wireless storage device. Datacase, available on iTunes for $7, works with any WiFi-enabled PC or Mac. It even works with Linux and FTP. You can stream media files using Datacase, or view document files on the iPhone. For relatively small storage requirements, Datacase eliminates the need to carry a portable hard drive in addition to an iPhone. Most recent comments on "Wireless Data Storage Devices"
Bob, re: storage, could you please write an article on "spintronics" for us? From what I've been reading, this technology is going to revolutionize the entire computer world. It is being said that it will increase speed and broaden storage options beyond our wildest dreams. I would love to hear about it from your perspective. I would also be interested in hearing your recommendation about the best spintronics development company for investment. So, with all of these options, the highest capacity is 500 gig? I'd want at least a 1 terabyte as that is what my usb external drives hold. Bob, I have a D-Link wireless router with a USB port. I connected a portable hard drive to it and am able to use that as wireless data storage. This solution takes a bit more work but may be cheaper and offer more storage for some users.